There is an outdoor area at the side of the pub. What did you think of The Hansom Cab? Beetroot Salad, goats cheese, tomato rissotto ? I'm amazed that you can find anywhere that serves that kind of shite. If you eat that kind of thing, let's face it .... you're never going to be happy are you ? Get a steak down your neck and bloody cheer up ! So I did go back and have dinner with my (practically) mother in law and boyfriend and can report it was fantastic! I had the prawn cocktail and a pie in a pot and both were exactly what you would want. Fresh, clean tastes, piping hot and lovely and cold where appropriate. The staff are lovely, there was a man sitting at the bar with a couple of beautiful dogs. It feels like a proper pub! Dinner wasn't exhorbitant and I didn't feel rushed or neglected. It was really, really lovely. You really should pay a visit to decide for yourself! Very excited that The Hansom Cab has opened today as a proper pub again with an awesome menu! My mum and her friends went at lunchtime and for it to be on our dorrstep is so so exciting!! I'm off there later, so I'll let you know what it is like now! interesting review from the 28th of April 2011: speaking about how in the winter there is a roaring fire. the pub had only just been refurbed then, so he could not possibly have been there whe this mythical roaring fire was lit. or is the real identity of this writer perhaps mr morgan? perhaps the previous 5 as well, given that most venues do not attract so many reviews in a time span of 3 weeks? let keep it hoest, shall we? Pretentious, over priced, stuffy atmosphere, it is neither a good pub or restaurant. No vegetables despite the waiter promising"A medially" to go with my husbands very disappointing chicken, when they didn't arrived he apologized and said "You only get them on a Sunday"! Given that the bill for 6 was just under £500 V expensive for what it is! Lovely environment, but the food was SO DISAPPOINTING. Maybe I ordered the wrong thing, but my beet root salad was flavourless (even the goat's cheese) and my tomato risotto was dreadful, like tomato sauce out of jar. I was here on a business lunch and really hope everyone else enjoyed their meal more than me! Lovely pub but ridiculous food prices. My very modest rib-eye steak with a virtually equal fat to meat content, plus two pieces of undressed lettuce, and a few (seven) large chips, cost a staggering £22.50. My colleague's chicken dish featured a piece of meat which had almost certainly come from a the chicken equivalent of Ronnie Corbett and was £14.50. I do admit that the rugby ball-shaped piece of fois gras was delicious, but again way over price for a tiny starter. I'd definitely visit the pub again, but its crisps and nuts from now on! I love everything about this place. the bar staff are awesome people to chat to- they are knowledgeable, fun and down to earth, as well as clearly being very hard working. The food is absolutely fantastic - my favourite dishes so far are the parfait, the scotch egg, the mussels, the burger... and there's more, can you tell I've been a few times?! On top of this the prices are really honest and very fair - surprising, i think, for a pub smack bang in the middle of Rich London. I love how relaxed it is: you can have your lunch/dinner in the bar area watching the regulars sip on their pints of bitter, or you can disappear around the corner into the slightly more moody back 'restaurant' area of the pub. in the winter there is a roaring fire adding to the dark wood and real local pub atmosphere. All in all its a lovely local serving top notch booze and grub at good prices - perfect combo! Absolutely adore this pub since it's been taken over, the food and atmosphere are amazing and he bar men aren't bad either! There's always a welcoming buzz and a relaxing environment. 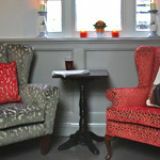 This warm and welcoming pub off High Street Kensington has been getting plenty of column inches since it was taken over by the Morgan brothers, Piers and Rupert, at the tail end of 2010. Having subsequently installed a top chef in the kitchen, Ollie Couillard, formerly of Michelin-starred La Trompette among other weighty positions, The Hansom Cab is now knocking out highly respectable food as well as a solid range of ales, live music and good times. While the involvement of Piers is, for obvious reasons, the thing most websites and papers choose to focus on when talking about The Hansom Cab, it’s his brother Rupert who you will find behind the bar making sure the pub keeps ticking over day-to-day. Formerly of Guy Ritchie’s Punch Bowl in Mayfair, Rupert Morgan has the look of a man who has got plenty of stories to tell and he’s in his element behind the bar – both very valuable assets in a landlord. The pub itself has the feel of a neighbourhood boozer, one that’s quite at home among the colossal mansion blocks nearby. 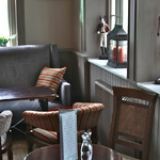 The front section acts as the pub proper, with a traditional air and high stools at the bar allowing you a close-up of their five real ales and selection of malt whiskies amongst other things. To the rear, the back room is set out for eating and it’s a room with creaky floorboards, dark red walls, black and white photos of London and tables for various size of groups but, most noticeably, cutlery and napkins set up at the bar section for individual diners or people who wish to sit side-by-style, American-style. There’s a good buzz about the pub, from early evening right through to closing time and the traditional Irish music session (every Thursday) helps elevate the pub way beyond the norm. The clientele are largely well-heeled locals and there’s a definite feeling that the owners’ connections help bring in a few more glamorous punters than your average pub. Head chef Ollie Couillard is very highly regarded in foodie circles and at the Hansom Cab he’s settled for crowd-pleasing gastro pub fare with plenty of French embellishments and the odd curveball. The scotch duck egg (£7) is a phenomenal way to start off. The portion size is huge and, when its crispy coating is sliced in two, the yolk is slightly gooey and the sausage meat stuffing it is ensconced in is delightfully seasoned with herbs and garlic. This is one seriously good scotch egg. Alternatively, an uncommon dish of marrow (and toast) is served diced inside the bone. The unctuous marrow is served with a little pot containing parsley and capers and the sharp, salty flavour of the capers counterbalances the fatty marrow. Mains include a very respectable bavette a l’echalotte (£14.50), a classically French dish with a shallot and red wine sauce poured on top, or the smoked mackerel, chorizo and new potato dish, a dish that gives a nod to Spain. Portions are so generous that a pudding may be a stretch too far but classics like the bread and butter pudding with ginger ice cream (£6) are on hand to reward those with hearty appetites. Five rotating real ales include brews from Sharp’s and Deuchars (IPA). 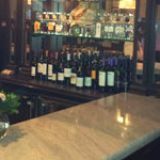 The wine list is way above average, too, with some very fine wines on offer and even bottles of Laurent Perrier Rose visible behind the bar should the need arise. A bottle of the Tempus Cabernet Sauvignon (around £18) blasts the senses with ripe brambly fruit and it’s got plenty of body to represent decent value for money. After dinner, you may be offered a concoction that was originally created at the Punch Bowl, the Hand Grenade. A woozy concoction of a shot of Morgan’s spiced rum and a shot of Jagermeister served in pint glass containing Red Bull, this is not for the fainthearted and shows this pub has a party streak bubbling away below the surface. 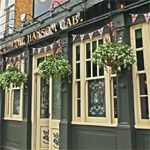 It may become best-known as the pub Piers Morgan has a stake in but while he’s away hosting one of the USA’s most-watched programs, the Hansom Cab is in the capable hands of his brother and it has a top-quality chef in the kitchen. All in all, it’s a great example of how to create a foodie pub without losing sight of what a pub should be – a place for people to drink and enjoy good times. Great staff & atmosphere. Didn't eat but will return for a meal. This used to be my local back in the 80's, Piers has done a good job. A friend of mine thought the pub was called "The Handsome Cad"!! Simply fantastic! Love the food, the staff and the atmosphere is fab. Best meal i have had for a while! highly recommend! will be returning soon. This pub is actually my favourite pub in London. Very nice area. Charming staff and food is simply delicious. I had chicken liver parfait for my starter followed by risotto. both were the best meals i have had in London for yeas. The atmosphere is also fantastic in there. Hear that new management is responsible for this, so many thanks to you. will definitely be returning! i recommend to everyone! We have been going to this local for a number of years and love the original true pub feel of this establishment. We have just read that Piers Morgan has just taken it over (note he calls it "His" pub) though I would like to remind him that it has been "our local " and I hope that he does not turn this into a "trendy gastro pub" but rather retain the original intent of a good local. Good luck Mr. Morgan we shall be watching!